I just went to UDC to buy a KH 26" and they are out of stock. Josh says they'll be getting the new 2016 model in April. Anyone know what's changing? We generally have to wait until Kris posts his product lineup thread. Can I start? I think that they come with a built in jet pack. If the jet pack is a geared hub I hope it's optional because I don't need one. If it's not optional then I'll buy an Oracle. 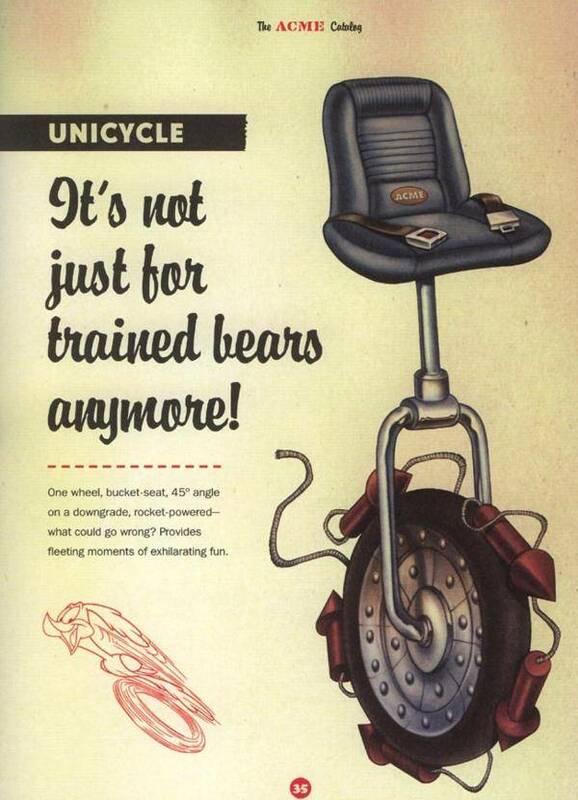 It would be helpful to know more details now so I can decide whether I should wait for this new unicycle. I really want a KH 26 without a geared hub. Kris please make them option. Last edited by Vertigo; 2016-01-08 at 08:10 PM. 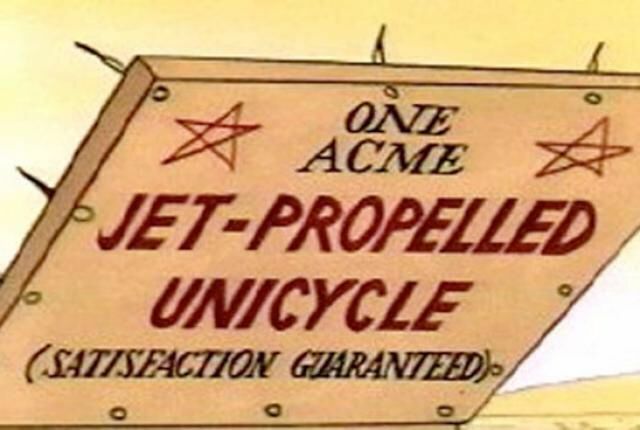 things like that with a jet pack should be labeled "ACME CORP."
Last edited by wobbling bear; 2016-01-08 at 08:31 PM. I want a magenta 26 KH without a geared hub and a choice of KH seats. mmm doesn't look like the local ski clubs would be happy with me if I decided to ride that on their trials, might melt the snow. But that looks like the missing ingredient needed to make the nimbus toast rack to become a reality. Is there a KH/Nimbus collaboration going on here? I doubt they'd start selling KH unis with a forced geared hub - that'd jack the price up a lot (Unless Schlumpfs are now cheap as hell, in which case I'll put my name down for one right now!) and as you said, many people are happy to ride without them. On the other hand... If you've managed to make Schlumpfs cheap enough that I can get a KH G36 for roughly the same price as a 2015 KH unG36... You may have just caused a universe inplosion. They're also out of KH 26" frames. So I can't even build one from scratch. Does Kris come out with a new unicycle line up every year? It just doesn't seem like there's that much he could change other than a new hub or titanium frame. A triple titanium frame like Triton makes would be nice. Now that I think about it I don't want an Oracle instead of a KH. I already have the 29er version and it's ok but I'd by the time I upgrade the cranks and seat I might as well get a KH (if I can ever get one when they're in stock). Last edited by Vertigo; 2016-01-09 at 01:09 AM. No. Kris does usually update a thing or two each year in his lineup, but it's not always a total revamp of the line. Could be a slight modification in the crank style, or a fat model. You never know. What I do know is that it'll be a cold day in hell when KH unis come stock with a Schlumpf. Usually not much is changing, and the 2015 brought loads of changes. Maybe another reseller? I think the 26" was skipped during the 2015 overhaul (unlike the 24"). This is probably why it's coming this year. new frame, knard, wider frame to fit the knard, hub, saddle. 26 got the same treatment. : ) I would think it's going to be the same (amazing) wheel. Yes, exactly what I was thinking. Maybe it will get fatter this year? Seems unlikely since there's that new Oregon coming out. I wonder why the older model KH wasn't built wide enough to take a Knard or Duro? Is there a big disadvantage to having a tire under 3"?